Arnold Schwarzenegger’s success was largely due to his devotion to his craft. He believed in giving everything that you have all of the time. The level of devotion that Schwarzenegger had in bodybuilding (and Hollywood) was not seen before that time, and quite possibly, has not been seen since. 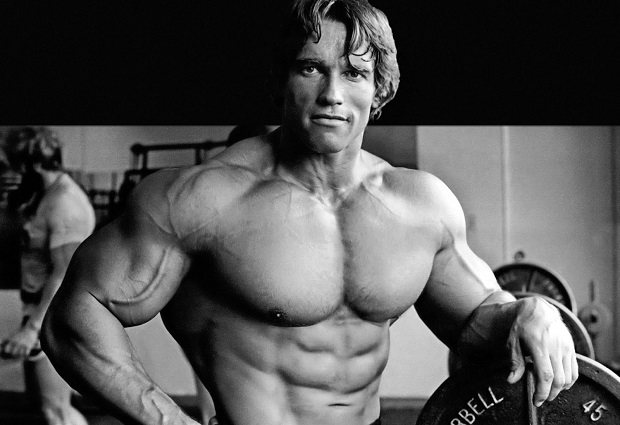 If you know no one else in bodybuilding, you know Arnold Schwarzenegger. If there was ever a man that truly left his mark on the world of bodybuilding, it was Arnold Schwarzenegger. His muscular physique was simply amazing when he competed. If you follow his training rules today, a lot of them still hold true. Arnold once said, “You’ll find, as I did, that building muscle builds you up in every part of your life.” This statement pretty much sums up his overall attitude toward his time spent in the gym. You have to give it everything you’ve got in order to see results. “Bodybuilders who have to force themselves to go to the gym and work out will never achieve the kind of success possible for those who can’t wait to hit the gym and start pumping iron,” Arnold stated in The New Encyclopedia of Modern Bodybuilding. Schwarzenegger’s philosophy was that bodybuilding is not a single-event endeavor. If you really want to see success, you must focus on all three components including your training program, your nutritional intake and your mental approach. His workout routine was built on his belief that it is essential to get the right nutritional elements into your body. He stated that in order to build muscle, you must fill your body full of quality nutrients. You should never slack off and turn to junk food to fill the calorie void. If you want to build lean, solid muscle, quality nutrition is key. On the fat loss side of things, one of the biggest strategies in Arnold Schwarzenegger’s workout routine was calorie cycling. This involved having some higher calorie days interspersed with some lower calorie days in order to prevent his metabolism from slowing down. This still works to this day as a way of keeping the body on its toes. He advised that on any calorie-reduced diet, if you went long enough you would see your metabolism slowing down, making further fat loss incredibly difficult. Set your average caloric intake target for the week and then stagger your calories with both high and low caloric days. For Arnold, pushing your body to the limit was the quickest route to muscular success. He felt that both research and experience demonstrated that the most training gains came when a weight was lifted that was between 70% and 75% of the one-rep max. His recommended range of reps per set was 8-12 for upper body movement and 12-16 for lower body movements. Additionally, training to the limit, according to Arnold Schwarzenegger, is a must. It’s only at failure when every single muscle tissue is contracting in full force and when the true results take place. This is echoed by so many bodybuilders to this day. For Arnold Schwarzenegger, training wasn’t just a means to create a muscular body, but rather a way to grow and develop into the best person he could be. As much as he loved his time in the gym, he also knew that rest periods were vital to success. He was well known for his legendary toughness, but also realized that there was a fine line between enough and too much. If you crossed that line, overtraining would set in. He recommended 48 hours of rest after working larger muscle groups and slightly less for the smaller ones. He also felt that as your training level progressed, you’d be able to handle more work with less recovery time and could tolerate more frequent workouts. Finally, he believed the best way to treat injuries was to prevent them. His prevention methods included always performing a thorough warm-up before workouts and stretching once he was finished. With the workout routine below, Arnold recommended a rest period of 1 minute with the maximum rest period being 3 minutes. After 3 minutes, the body is pretty much recovered. There is no real advantage of going longer than that.